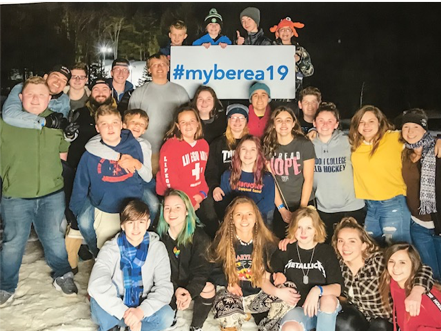 At the start of the year, we invited and encouraged the church to be prayerfully supporting each of the 28 students and leaders that were heading up to snow camp at Camp Berea. We asked you to pray for the hearts of students to be focused and captured by the gospel; we asked you to pray for the Holy Spirit to guide and give wisdom to each of the leaders; and we asked you to ultimately pray that God would show up and do what only He can do—and wow, did He ever! So THANK YOU for your faithfulness in praying and supporting us this year! Some of our YC guys fiercely grace Berea’s own Instagram page! For 48 hours of snowtubing, prayers, small group study, late night convos, milkshakes, fries, paintball, worship, basketball, laughter, smiles and JESUS. Snow Camp 2020 here we come! 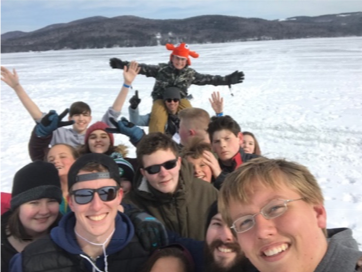 Taken smack dab in the middle of frozen Newfound Lake! Some of the girls hanging outside their cabin! Bekah, Millie and Dan on their way to session!